Round 1 at Brands Hatch in Kent saw me complete 106 laps of the circuit. Two qualifying sessions and eight races. To start off on Saturday I had the minitwins qualifying where I set a fastest time of 57.301 seeing me start from 28th in a grid of 39. I was happy with this as it was the first time I had ridden the engine I only finished building a few weeks ago. I managed to convert a start of 28th into a finish of 26th and upped my time to 54.940 only 0.5 off my PB. 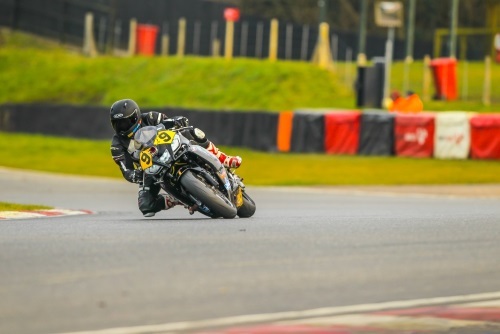 Had some interesting grounding problems on the bike which at one point saw me with a two wheel drift through paddock hill whilst passing someone. In the second race I went backwards a couple of spots from 26th to 28th with a best time of 55.8 so tomorrow ill be starting from the 10th row in 28th. The Thunderbike sport race was excellent and it seems much more competitive this year. I set a qualifying time of 55.779 which gave me a starting place of 16th. I went backwards off the start and after the first lap was in 20th a few laps later and I ended up finishing in 23rd with a fastest time of 56.955. The second race was squeezed in at the end of the day just as the light started to fail, there was only 24 turned up and I was starting from 23rd. I found my self stuck behind a slower rider and lost touch with the point scoring places, when I eventually got past I finished in 16th with a 57.024 second laptime, 8 seconds behind 15th the last point scoring place. To top my Saturday I got a spot prize from Steve Jordan Motorcycles. Sunday saw four more races, two Minitwin (MT) and two Thunderbike sport (TBs) races. I started the first MT race from 28th and finished in 28th. Then in the second one I finished in 28th again. I lost a few places in both races off of the start and made some back up during the races. My fastest MT time was 54.940. I started the third TBs race in 16th and finished in 17th. I finished the fourth TBs race in 14th and scored my first points of the season. My best laptime in the TBs class this weekend was 56.271. All of my racing this weekend was completed on a set of tyres I bought last year, the rear is the same one my engine covered in oil. The goal this weekend was to complete all the races I entered on this set of tyres and get the bike run in. I’ve also found that my bike will complete a 10 lap race on two litres of fuel so its cheaper to run this season, bonus. Next up in the fantastic Donington with the Melbourne loop and ill have a new set of tyres to play on. See you all there.